We’ve all heard that replacement windows are the way to go if you want to increase the energy efficiency of your home and building (and reduce greenhouse gas emissions associated with generating energy). While it’s true that they will reduce heating and cooling bills, the up-front investment may not be in the budget. 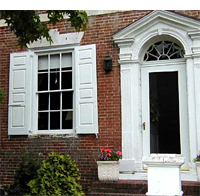 However, there are other solutions that are perfect for historic homes or buildings, or those with single-pane windows…. As I’ve previously mentioned, proper sealing and caulking around windows is a key strategy to make any place more airtight and help you save on energy costs. One inexpensive and easy-to-install option, perfect for renters and homeowners alike, is a plastic film or sheeting placed over the windows. It reduces drafts (and heating bills) by trapping air between the window glass and the film. This layer of air becomes an insulator and can almost double the R-value of a single-pane window. The shrinkwrap variety is virtually invisible. It’s available from home improvement and hardware stores. Advanced Energy Panels are another suitable choice and add two additional layers of glazing to your existing windows. They are custom made and mounted on the inside of your windows, so they detract from your window’s appearance on either the outside or inside. Made of polyolefin, they are made to last for years. Storm windows are now offered in either exterior- or interior-mounting varieties. Low E and UV-protection models are available too. The interior-mounted ones can easily be installed by “do-it-yourself” homeowners. Storm windows also reduce outside noise from entering interior living spaces. photo courtesy of Innerglass Window Systems, an interior storm window company.